We would only open the exhaust when purging the machine, so I only envision one machine needing extraction at a time. We never run more than four machines total, so worst case scenario, we’d need to extract from four. I envision having flexible ducting to each machine, with a open/closeable vent at each machine above the nozzle. If that isn’t feasible, I would see if there is a way we could fabricate an enclosure around the nozzle. 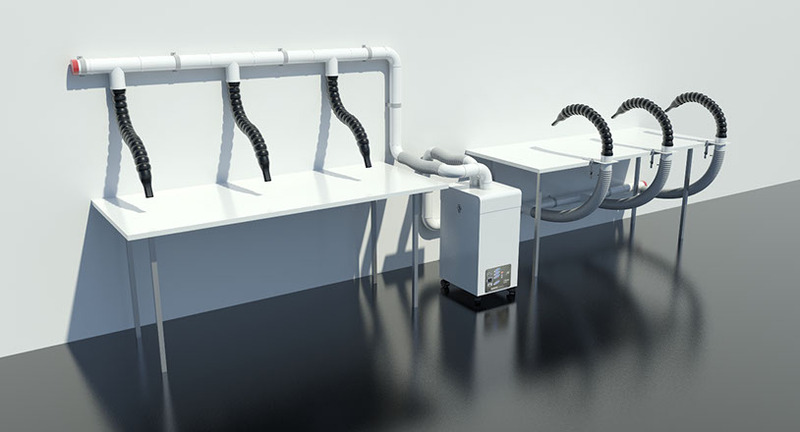 As far as the manifold goes, I envision something very much like the one pictured in your brochure with the ten stations (an 8-10 ft. section of pvc with ports coming off of it), the only difference, is the flexible hose (duct hose) would be longer than what is pictured. After going back and forth discussing various options, we have decided to go with the CSA626 Fume Extractor with a modified filter sequence incorporating a 20″ chemical filter section. I just put the fume extractor to use for the first time; on a machine/material that has known to “smoke out” the building…let me say, I am thoroughly impressed with the performance of the unit. I have to admit, I was somewhat skeptical when you stated that it would remove the smell as well, but sure enough, it’s performing just like you said it would. It looks as though all of the research/questions have resulted in receiving a great product…thanks! Call us toll free, 1-800-626-0664, for help with your product selection, or use the contact form below. Up to 8 soldering stations can be filtered using a single Quatro SPH-426 high pressure filter system. Systems comes complete with patent pending Laser Blue Gel Seal ensuring zero by-pass for any toxic fumes. Each system comes complete with initial set of filters including a 30% ASHRAE rated pre-filter, 99.97% certified medical grade HEPA filter, and an 8 inch deep bed chemical filter. The microprocessor control panel is complete with visual and audible alarms, digital speed control, the ability to be interlocked for remote on/off, auto flow adjusts speed of blowers as filters get dirty. Available accessories include snap together ducting / piping, industrial heavy duty hose, and table mounted extraction arms with damper control and various nozzle attachments.